I have just posted an update of my introductory undergraduate Econometrics (book, slides, R code, EViews code, data, etc.). Warning: although it is significantly improved, it nevertheless remains highly (alas, woefully) preliminary and incomplete. I intend to keep everything permanently "open," freely available on the web, continuously evolving and improving. If you use the materials in your teaching this fall (and even if you don't), I would be grateful for feedback. A Second NBER Econometrics Group? The NBER is a massive consumer of econometrics, so it needs at least a group or two devoted to producing econometrics. Hence I'm thrilled that the "Forecasting and Empirical Methods in Macroeconomics and Finance" group, now led by Allan Timmermann and Jonathan Wright, continues to thrive. Timmermann-Wright is strongly and appropriately time-series in flavor, focusing on developing econometric methods for macroeconomics, financial economics, and other areas that feature time series prominently. In my view, there's a strong and obvious argument favoring creation of a second NBER working group in econometrics, focusing on micro-econometrics. Quite simply, econometiric methods are central to the NBER's mission, which has both macro/finance and micro components. Timmermann-Wright addresses the former, but there's still no explicit group addressing the latter. (The Bureau's wonderful and recently-instituted Econometrics Methods Lectures include micro, but the Methods Lectures are surveys/tutorials and hence fill a very different void.) An ongoing working group led by Chernozhukov-Imbens-Wooldridge (for example -- I'm just making this up) would be a fine addition and would nicely complement Timmermann-Wright. 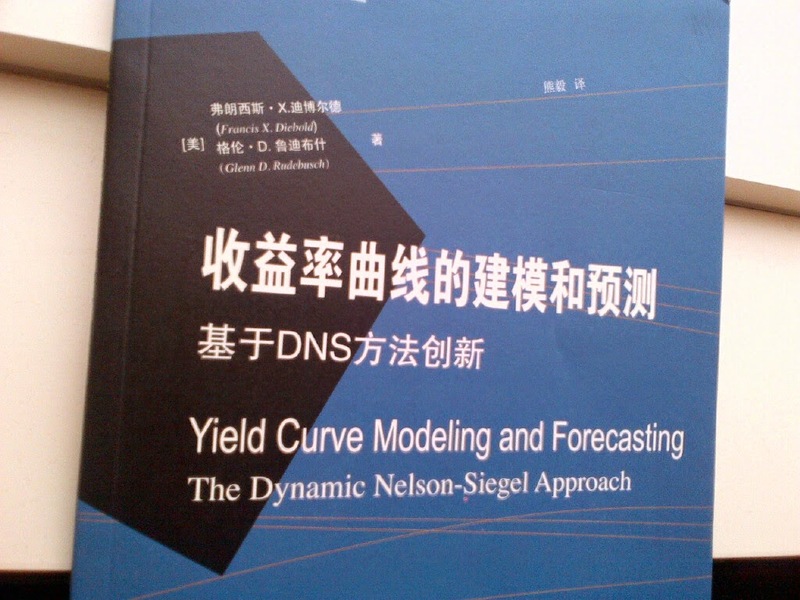 A Chinese edition of Diebold-Rudebusch, Yield Curve Modeling and Forecasting: The Dynamic Nelson-Siegel Approach, just arrived. (I'm traveling -- actually at IMF talking about Diebold-Rudebusch among other things -- but Glenn informed me that he received it in San Francisco.) I'm not even sure that I knew it was in the works. Anyway, totally cool. I love the "DNS" ("Dynamic Nelson-Siegel") in the Chinese subtitle. Not sure how/where to buy it. In any event, the English first chapter is available free from Princeton University Press, and the English complete book is available almost for free (USD 39.50 -- as they used to say in MAD Magazine: Cheap!). In the early 1990's Steve Durlauf had an idea for an "Empirical Methods in Macro" NBER group, and he asked me to join him in leading it. Bob Hall kindly supported the idea, so we launched. Some years later Steve stepped down, Ken West joined, and we decided to add "Finance." I was also leading a "Forecasting" group with highly-related interests, so we merged the two, and Diebold-Durlauf "Empirical Methods in Macro" then became Diebold-West, "Forecasting and Empirical Methods in Macro and Finance." Quite a mouthful, but it worked! We met at least once per year at the NBER Summer Institute, sometimes more. Papers drawn from the meetings sometimes appeared as journal symposia. I'm particularly fond of those in International Economic Review (1998, 811-1144), which contains Andersen-Bollerslev on realized volatility from underlying diffusions, Rudebusch on measuring monetary policy in VAR's (with discussion by Sims and a feisty rejoinder by Rudebusch), Christoffersen on interval forecast calibration, Diebold-Gunther-Tay on density forecast calibration, among others, and Review of Economics and Statistics (1999, 553-673), which contains Baxter-King on bandpass filters for business-cycle measurement, Kim-Nelson on measuring changes in business-cycle stability using Bayesian dynamic-factor Markov-switching models, and Gallant-Hsu-Tauchen on range-based asset return volatility estimation, among others. I eventually stepped down around 2005, and Mark Watson joined. (Mark and I had earlier edited another group symposium in Journal of Applied Econometrics (1996, 453-593).) So Diebold-West became Watson-West, and the group continued to thrive. In 2013, Mark and Ken passed their batons to Allan Timmermann and Jonathan Wright, who are off and running. This summer's program was one of the best ever, and the meeting was heavily over-subscribed. Time to Re-Think NBER Programs? A last thought. Economic Fluctuations [an NBER program] merged with Growth [another NBER program] in the mid 1990s. At the time there was a great confluence of method as well as interest. Growth theorists were studying growth with Bellman equations, dynamic general equilibrium models of innovation and transmission of ideas, thinking about where productivity shocks came from. Macroeconomists were using Bellman equations and studying dynamic general equilibrium models with stochastic technology, along with various frictions and other propagation mechanisms. That confluence has now diverged. ... ...when Daron Acemoglu, who seems to know everything about everything, has to preface his comments on macro papers with repeated disclaimers of lack of expertise, it's clear that the two fields [fluctuations and growth] really have gone their separate ways. Perhaps it's time to merge fluctuations with finance, where we seem to be talking about the same issues and using the same methods, and to merge growth with institutions and political or social economics. The NBER Summer Institute group in which I most actively participate, Forecasting and Empirical Methods in Macroeconomics and Finance (one of several so-called working groups under the umbrella of the NBER's program in Economic Fluctuations and Growth), has been blending fluctuations and finance for decades. But we're intentionally narrowly focused on applied econometric aspects. It would be wonderful and appropriate to see broader fluctuations-finance links formalized at the NBER, not just at the working group level, but also at the program level.